On Tuesday, January 22nd the Friends of the Julian Library Arts and Letters Committee hosted an inspirational and heartfelt program titled Charlotte Mitchell’s Poetry in Glass. 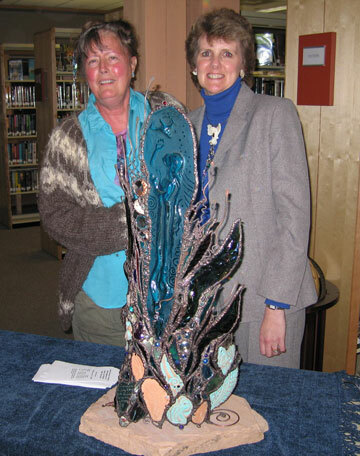 Charlotte Mitchell, a renowned and beloved local artist, attended the event and dedicated a magnificent glass sculpture she created for our Julian Branch Library. The piece, titled Hope, was unveiled in front of 75 people attending the Poetry in Glass program. Charlotte named the work after a favorite poem by Emily Dickenson. The sculpture was presented to the Julian Library as a gift by the Friends of the Julian Library, and will remain on permanent display in the main library room. Charlotte’s produced the sculpture with the intention to incorporate her deep love of books, poetry and the Julian Library into the work of art. Working together, Charlotte and her husband Brent completed the dramatic glass sculpture in just one week. We were deeply moved by Charlotte for making a special trip to Julian to speak about the piece she designed. She was able to stay for the evening’s presentation, which included a 45-minute video presentation, taped in her Wynola studio by Brian Kramer approximately a month ago. The audience was moved and inspired by Charlotte’s presence, by her positive attitude, and her undying love of this community and our library, because libraries offer everyone the ability to gain knowledge. The evening was equally as important and inspiring to Charlotte, to have so many people supporting her during her fight with cancer. As her website says, “I will fight, fight, fight!” She is a unwavering inspiration to us all. You may find updates about her health, and her work at http://www.themitchellstudio.com. Persons interested in viewing the DVD or purchasing it may contact the Friends of the Julian Library, at (760) 765-2239, or the Branch at (760) 765-0370.